In April 2017, Dr. Anna Boshnakova was invited to present her recent research in the area of interpretative anthropology at the 113th Annual meeting of the American Classical Association of the Middle West and South, held in Kitchener, Ontario at the invitation of the University of Waterloo. Her study was part of a collaborative project with researchers from Canadian and European universities, funded by SSHRC and supported by Sheridan’s Professional Development funding. 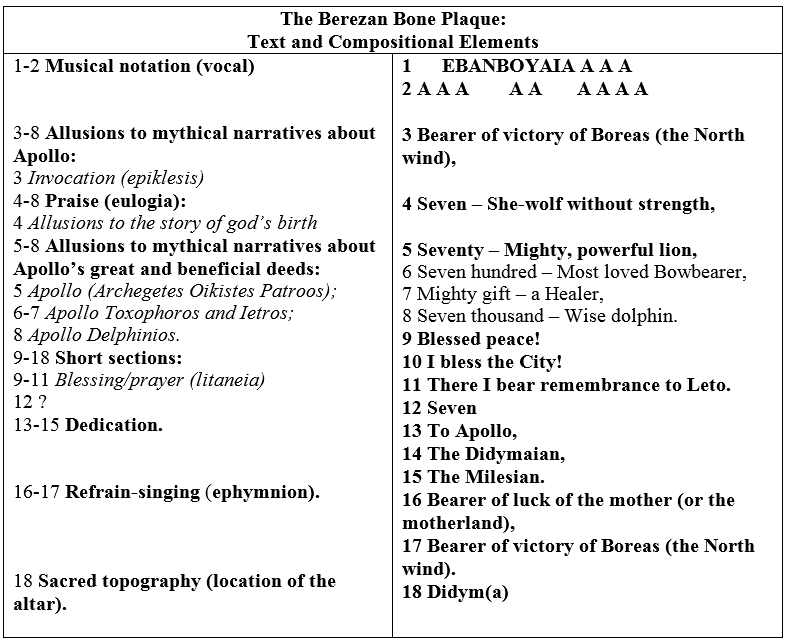 In her paper “Prosodion Written in Bone: An Inscribed Bone Plaque from the Berezan Island,” Anna proposed a new interpretation of the Berezan bone plaque, one of the most interesting, and at the same time, the most disputed epigraphic records from the ancient Black Sea region. Based on the palaeographic analysis the plaque is dated from the late 6th to the early 5th centuries B.C. E. (between 550 and 525 BC) and is identified as the shinbone of a bull or a horse with dimensions of 4.8 x 3.5 cm and a thickness of 3 – 4 mm. Three strange texts were scratched on both sides of the bone fragment. On the polished side which is considered to be the obverse, two of the texts are overlapping because are positioned in both directions. On the reverse of the plaque, the inscription is positioned in the upper and the lower zone, the medium being unusable for the remains of bone marrow that are still distinguished. During the last 30 years the three texts have been analyzed independently and interpreted either as sacred, magical, membership-token, or as student’s writing exercises but no one of these explanations answer the questions such as why three independent texts were inscribed in such an unusual way on a single bone plaque and not in three individual plaques; or why somebody will inscribe two lines of nonsense inscription when there is no enough space for the other texts? On the back of the plaque, the writings are distributed in the upper and lower zone. The middle of the bone fragment is left untreated and a trace of dried bone marrow is evident. These and many other questions gave enough grounds for Anna to go back again to that epigraphic record but using an approach entirely different from that of the previous investigations: to analyse the inscriptions on the bone fragment not as three individual texts without connection between them, but as three interconnected parts of one text. In this case the structure of the text includes 18 lines total, of which two lines of letters recorded above the text. Researching different epigraphic records and looking for clue, unexpectedly she found records with similar text structure among the musical documents. Would it then be possible to assume that the two strings of letters may be interpreted as ancient Greek musical notation? During her research she found sufficient evidence in support of that hypothesis. Among all 60 musical fragments published in 2001 by M. West and E. Polmann, Anna Boshnakova found several parallels with the same type of musical notation: notation over the first line only, double lines of musical notation and a line with repeated musical note. One of the most interesting parallel for musical notation over the first line only is fragment 4 from the collection of cartonnage scarps in the Ashmolean Museum, dating from the third to second century BC. The fact that musical notation appears only over the first line suggests that the same melody served for every line. 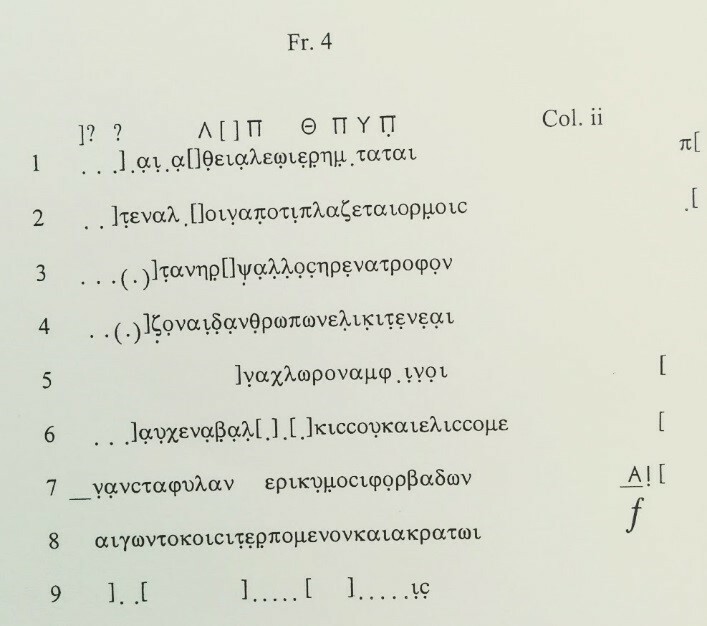 During antiquity, the ancient Greek notation consisted of letter-forms placed above text syllables and was capable of representing pitch and note-duration, and to a limited extent, harmony. According to the collection of ancient Greek musical documents the earliest document with preserved musical notation is from 3th c. BC, this is a fragment from Orestes by Euripides. At the same time we can trace the roots of musical literacy back to authors as early as Lasus of Hermione (late 6th century B.C.) Even though his theoretical musical writings are lost, group of literary sources (among which those of Pythagoras, Philolaus, Archytas, Aristoxenus, Euclid in his The Division of the Canon (Katatomē kanonos, the Latin Sectio Canonis), Cleonides, Aristides Quintilianus, Alypius) reveal that there were theorists from Archaic and Classical Greece who devoted their efforts to develop agreed standards of musical notation, reducing the harmoniai to a system. One of these theorists-empiricists was Eratocles, who lived probably in the late 5th c. BC. Along with his students without a doubt he played a prominent role in the creation of the musical nomenclature that persisted throughout Antiquity. On the other hand, indirect evidence Anna found in another group of sources: musical records on late Archaic and Classical vase paintings. Music related images show that the painters must have been frequent visitors to musicians’ studios observing in details the music lessons, different musical performances, and even the process of composing music. For example, the painters depicted vocal performance in the form of words or small circles coming out of the musician’s mouth. Instrumental performances were depicted with letters imitating musical notes, just like we “depict a melody” in an image using the symbols of contemporary musical notation. By analogy, the talented vase painter from 5th c. BC may have depicted letters imitating musical notes, undoubtedly identical with letter-forms that were used during the archaic period. Thanks to their precise depictions Boshnakova was able to reconstruct the process of composing music. Collecting rare music related images she found clear evidence that the practice of recording music (melographia) existed in the musicians’ guild long before it became fashionable with artists in the early 5th c. B.C. and long before to become a part of the mandatory education during the 2 c. BC. This also gave her a reason to believe that the two strings of letters scratched on the back of the Berezan bone fragment could be identified as musical notation. During next step of her research she analyzed the specific compositional elements of the text: possible record of the melody, an enumeration of the key moments of Apollo’s sacral biography in unrhymed metaphorical combinations, a blessing/prayer, a dedication, and finally a small refrain. 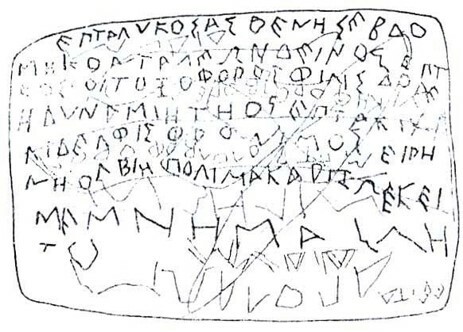 These compositional elements, as well as the early dating (late 6th – early 5th c. BC) provide all grounds for the document of Berezan to be defined as prosodion in the sense of “processional cult song”. The results of the reconstruction of the function and meaning of the Berezan bone fragment reveal a significant evidence of early (6th century B.C.E.) local musical enculturation. Just like the so-called Cup of Nestor dated to the Geometric Period (c.750-700 B.C.E.) 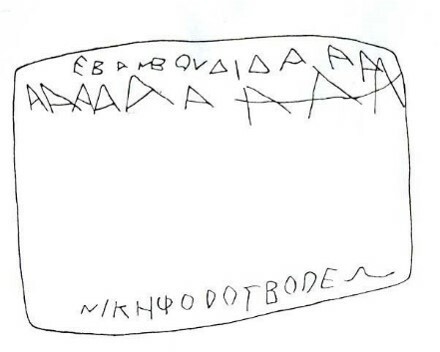 and bears one of the oldest known examples of writing in the Greek alphabet, comes from Pithekoussai, one of the earliest Greek colonies in the West, it is not a surprise that the earliest preserved form of Ancient Greek musical notation may come from a distant colony in the Northern Black Sea region. We do not know who recorded the prosodion on the bone plaque. The inscription itself indicates that the individual was trained in music. Paying attention to the notation he made an effort to preserve the music to which the text was supposed to be sung. On the other hand, he recorded not only the music but all the parts of the processional song, because this was the only way to transfer the religious tradition of the metropolis Miletus and the cult center of Didyma where Apollo was celebrated as Delphinios, to the citizens of Berezan – Olbia. 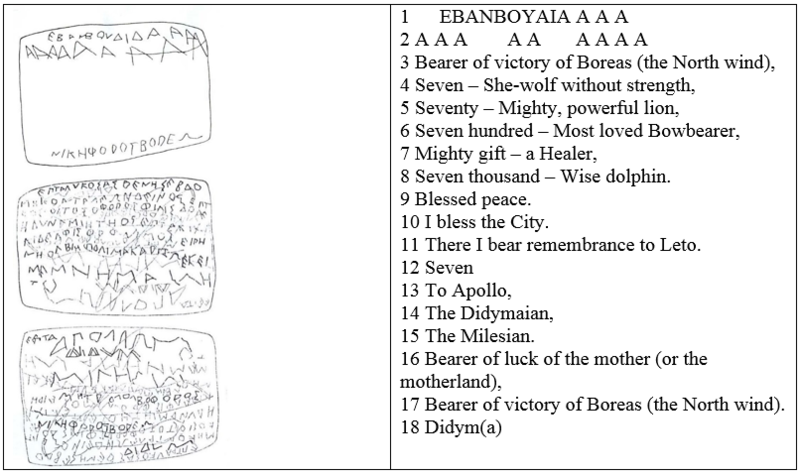 The results of the research show that the prosodion had been transferred to Berezan-Olbia as one of the traditional ritual performances of Miletus and Didyma, that were supposed to be practised by the Olbian citizens and sung during certain festivities.